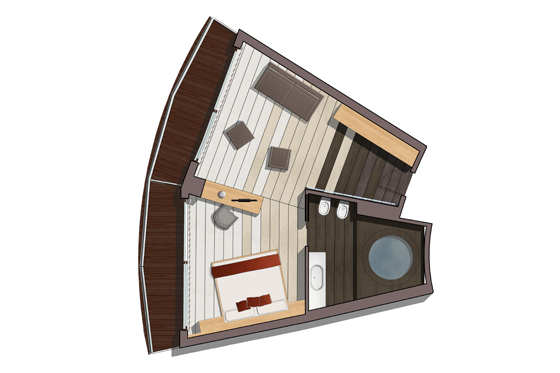 The Big Superior Suite is built on an area of ​​20 to 54 square meters includes: a bathroom that range from 9.60 to 10:35 m and a balcony that hovers between 20 and 64 sqm. It comes with: a zone of internal entrance hallway, double sofa bed and bedroom. This room offers the opportunity to see the coast through large windows. The decor, however, blends in perfectly with modern geometry cuts the warmth created by fabrics and designs of the walls. The bathroom, enriched by the presence of exclusive services of courtesy, focuses on a jacuzzi (circular) with spectacular lighting effects to make it even more enjoyable relaxation.